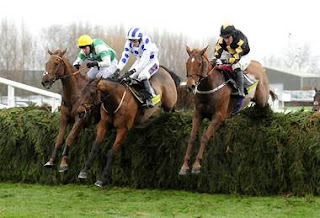 Saturday sees the biggest annual betting event of the year with the 2012 Grand National at Aintree & we have a strong fancy for the race, there's some decent racing beforehand though & we like Zarkandar in the Aintree hurdle. 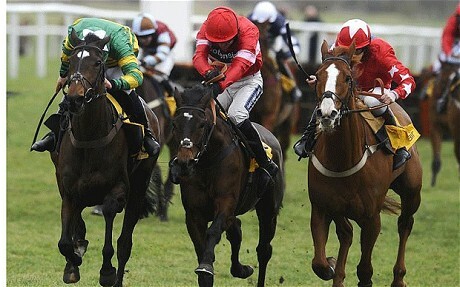 Paul Nicholl's 5 year old is taken to beat his older rivals here & prove his Champion Hurdle running to be all wrong. Nicholls' other runner Rock On Ruby won that Champion Hurdle at Cheltenham but the belief among the Nicholls' camp was that Zarkandar was by far & away their main hope, unfortunately his Ditcheat horses were a little under the weather at the time (Rock On Ruby was instead trained at a satellite yard) & Zarkandar didn't show up at all well beforehand & didn't give his true running, doing all his best work right at the end of the race. We're thoroughly unsold on the merits of last year's winner Oscar Whisky, he held off the returning Thousand Stars by a head that time & both of their form ties in strongly with Hurricane Fly, form that we'd argue was always overrated & now deflated thanks to Oscar Whisky & Hurricane Fly being comprehensively defeated at Cheltenham once they took on different horses rather than just each other or extremely weak fields. It could be argued that Oscar Whisky will be best suited to this 2 mile 4 furlong contest but we suspect he's only doen so well over the distance because so few top class horses even try it, apart from occasionally in this race. Zarkandar won at the meeting last year, stays on extremely well at the end of races & has the master jockey Ruby Walsh on board, odds of 5/2 are great value with trainer Paul Nicholls in good form at the meeting already. Cappa Bleu is our idea of the winner, a classy sort that has already shown he can handle tough conditions when 3rd in this year's Welsh National in horrible ground. Evan Williams' 10 year old is the right age as 4 of the last 6 winners have aged the same, he'll enjoy conditions more here than at Chepstow as the ground only looks like being on the softish side rather than heavy ground. Cappa Bleu hasn't been the easiest horse to train, with very few miles under rules on the clock but Williams has been sounding confident in the build up, reckoning that he now has him at hios very best. This is a horse that lined up for the Hennessy, that Denman won so marvellously, at odds of 12/1 & won a Cheltenham race, the Foxhunters, on his first start under rules - with such class we have to be keen with odds of 18/1 available in places. Of course Cappa Bleu could fall (this is the Grand National after all) but we don't see him being far away if he gets around & we're confident with regards to stamina & the ground. Dangers are obviously the Gold Cup winner Synchronised & Becher winner West End Rocker, especially with Alan King's horses going so well. With 40 runners & 30 fences people often say that 'anything' could win & 'it's a bit of a lottery' but if you look back through the stats 8 winners from the last 10 runnings have won at odds of 20/1 or shorter with only Silver Birch (33/1) & one of this year's runners Mon Mome (100/1) being the real upset winners. None of the real outsiders get us going much this time around but it is interesting to see Vic Venturi at odds of 66/1, Dessie Hughes's 11 year old finished 2nd to Follow The Plan in the Grade One Guiness Gold Cup at Punchestown last May & that horse won the Betfred Bowl here on Thursday. 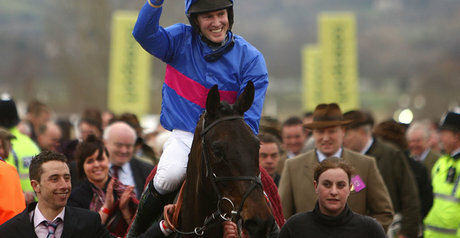 Rare Bob was behind in third at Punchestown yet is a shorter price here even though worse off at the weights & it could be worth taking a risk with a small each way bet on Vic Venturi who looks to have been targeted solely at the race & has won over these fences before in the 2009 Becher Chase.